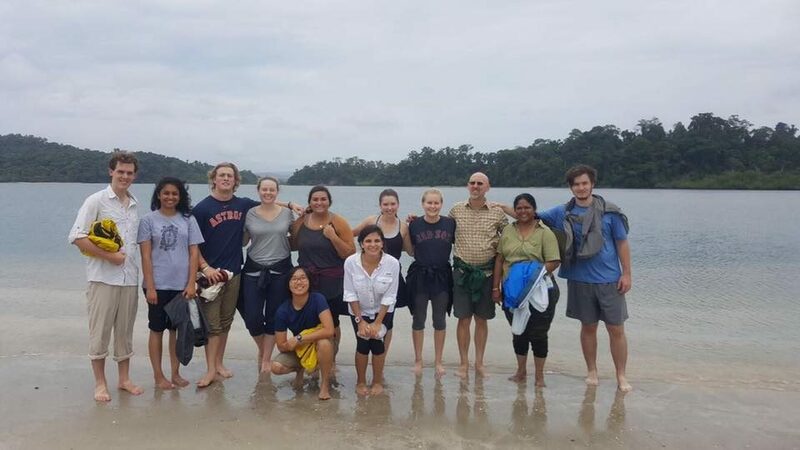 Last week, our study abroad group flew to the Andaman Islands to learn about biodiversity and environmental conservation from the Andaman and Nicobar Environmental Team (ANET). The Andaman Islands are a biodiversity hotspot, meaning that there are at least 1500 endemic species of vascular plants and 70% of its primary vegetation has been lost. 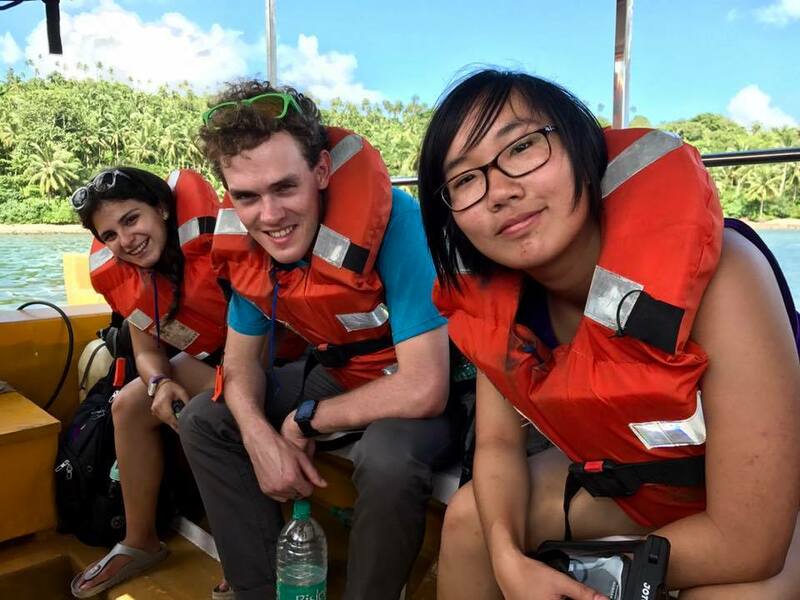 The weeklong trip was composed of lectures on the islands’ history and biology, field trips with ANET into the mangrove and rocky intertidal ecosystems, a visit to the Port Blair fish market, and exploration of Ross Island, North Bay, and Mahatma Gandhi Marine National Park. One of the main conservation lecture topics was the effect that human impact and global climate change has on coral reefs. Ecotourism is a huge part of the Andaman Islands’ economy and why many mainland Indians travel to the remote island chain. In this blog, I am going to describe and analyze my experience with coral reef ecotourism in the Andaman Islands and how it has been affected directly by humans and indirectly by global climate change, supplemented by relevant and scientific sources. The ferrymen shuttle us from island to island in the Andamans. Photo by Sophia Pessagno. 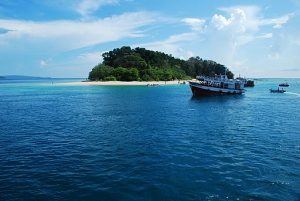 The series of trips to Ross Island, North Bay, and the Mahatma Gandhi Marine National Park were a large part of our experience in the Andamans. Ross Island provided us with some history on British Imperialism while the others had general information on the local environmental ecology. We joined the flock of Indian tourists on a ferry ride to Ross Island and North Bay to experience the history and wildlife of those regions, and hopefully see coral reefs, which are one of the largest attractions of the Andaman Islands. Besides being a beautiful sight for tourists, coral reefs provide quite a few ecosystem services that support the islands’ biodiversity and local economy. Dr. Paradise mentioned that they support local fisheries, provide habitat for and relationships with other organisms, protect the coast from adverse weather, are used in bioprospecting, and provide subsistence fishing for the locals. They provide valuable services that can be lost in a coral bleaching event when the coral loses their algal symbionts, which could cause them to die. Coral bleaching can lead to an algae-dominated coral reef, which is less biodiverse and fruitful in terms of ecosystem services (US Department of Commerce n.d.). Global climate change could destroy these rich ecosystems and their accompanying services and functions they provide to fisheries and people (Descombes et al. 2015). Protecting them from human impact and climate change is a huge obstacle that needs to be hurdled if we want to preserve species, industries, and people that are dependent upon their survival. One of the tourist ferries at the Mahatma Gandhi Marine National Park. Ecotourism is a large part of the Andaman Island’s economy. Along with many mainland Indians, we were tourists in the Andaman Islands who were looking to explore the rich biodiversity that its remote ecosystems offered. Though when we took the ferry to the North Bay to see the coral reef – the ecological equivalent of a tropical rainforest – we were mostly disappointed by what we saw. The coral reef was there: massive stretches of dense coral with small fish hiding in its nooks and crannies, but most of the coral was gray and covered by a layer of algae. The fish were few and small. If we were lucky, we saw a sea cucumber! It was kind of a case study about how humans can impact the environment and cause damage to the habitat, which is exactly why the Andamans are a biodiversity hotspot: it has lost a lot of its original wildlife due to human development, which includes ecotourism in this case. The impacts were pretty clear from what they showed us, but maybe other reefs were healthier. The glass bottom boat ride was not what I hoped it would be, leaving me wishing that I could have seen what it looked like 50 or 100 years ago when it was alive and well. Ecotourism can be damaging, which is why they restrict our activities to a small proportion of the coast. For example, when we went to Mahatma Gandhi Marine National Park, we only could go to a small coastal area on Red Skin Island. When we arrived at the island we went on another glass boat ride, expecting a healthier coral reef, but it had extensive damage just like North Bay. The boat “captains” were using the boat’s motor to get out to the reef from the coast but then used bamboo poles to push the boat through the reefs. At one point the driver lost his bamboo pole as it got wedged into the coral! If they provided 20 glass boat tours in one day, which seemed likely, then imagine the damage those poles do to the reef ecosystem! Additionally, we noticed that the boats were leaking oil into the water where we were swimming, which meant that they were also leaking as they drove into the coral reefs. Once again, imagine the damage that they do over time if they ran that glass bottom boat tour each day, with 5 boats, while also using those boats to ferry people to and from the island! Reyna, me, and Heather on a glass bottom boat tour of the coral reef ecosystem at North Bay. Photo by Sophia Pessango. Ecotourism ultimately provides a benefit to society and worldwide conservation efforts though there are some damaging elements associated with it. One of the main goals of the MG Marine National Park is to protect the wildlife in the area. I am hoping that most of the human-caused environmental damage is restricted to where they let tourists visit, which are two islands that are rotated semi-annually to let them “recover”. That said, I don’t think that 6 months is enough to do much good in terms of natural recovery, nor do I think that the damage is completely restricted to the area. We saw the boats pollute the water, but did you know that chemicals in sunscreen can also kill coral at certain concentrations (Downs et al. 2016)? Oxybenzone is the toxic chemical of concern that has exacerbated toxicity to coral in sunlight, the conditions when most people need to apply sunscreen. Our group is particularly pale and burn even if there is cloud cover, so we always apply sunscreen, and we definitely needed it at Red Skin Island! As melanoma is increasingly becoming more of a concern with global climate change, more people should be using sunscreen, which means more people could be contaminating the water if they are swimming where there are coral reefs. Although it seems that ecotourism could damage the environment, it should be restricted to a small proportion of area. The economic and educational benefits that come from coral reefs might be worth the cost of regional damage. Besides being an educational experience that provides the public an inside view of a beautifully diverse ecosystem, ecotourism can provide a decent source of revenue for the local and national economy (Thulasimala and Devdass 2010). Scuba diving, for example, can be a wonderfully educating and explorative experience for tourists, but new divers should first be briefed about the importance of protecting coral reefs and local wildlife. One of my friends on the study abroad program decided to go scuba diving as part of the tourist experience while we were at North Bay. He was already scuba certified but they gave a mandatory 15-minute training session that didn’t include any information about not disturbing the coral reef ecosystem. He said that people were running their hands through the anemone and touching the coral without regard to the possible impact on the environment. Maybe that could have been avoided by a more environmentally conscious briefing session by the instructors. A study in the Florida Keys found that divers who received ecological briefings caused significantly less coral damage than those who didn’t get briefed (Krieger and Chadwick 2013). Additionally, a study on South African coral reefs found that scuba divers who are photographers happen to damage more coral on average than novice divers, regardless of their experience level (Walters and Samways 2001). I’m not calling my scuba friend out, but he was using his GoPro video camera while scuba diving. Cameras, especially GoPro action cameras are popular for tourists to use during their activities such as scuba diving. If the findings of that South African study are accurate and generalizable, then coral damage by eco-tourists who aren’t briefed (like those in the Andamans!) and using cameras have the possibility of damaging coral reef ecosystems more than normal. If local wildlife authorities or conservation specialists inform the guides and instructors on how to respect and view the coral reef ecosystem in a careful manner, ecotourism in the Andamans could be sustained for generations of tourists to enjoy. Coral bleaching is a threatening effect of global climate change. On the topic of anthropogenic impacts – global climate change could possibly destroy much of the coral biodiversity throughout the world (Descombes et al. 2015). These threats to coral include ocean acidification and ocean warming. They can lead to mass coral bleaching, leaving behind forests of underwater coral graveyards. 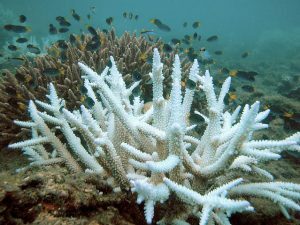 Increased water temperatures cause coral bleaching by killing the coral’s zooxanthellae symbionts rather than the coral themselves (Sammarco and Strychar 2009). That is why scientists are suggesting that we find other clades of zooxanthellae that might be able to handle the increasing temperature better. They also hypothesized that, if global climate change continues, the regions near the equator might become “hyper-tropical” as temperatures rise, reducing the global coral distributions in those areas (Sammarco and Strychar 2009). According to the NOAA guide to coral bleaching, some coral diseases are more virulent at higher temperatures, which promote more disease outbreaks as sea temperatures increase. Such diseases have partially reduced various reef areas across the globe, such as those in the Florida Keys, Caribbean, Great Barrier Reef, and Indo-Pacific Ocean. On top of that, increased atmospheric levels of carbon dioxide (CO2) from burning fossil fuels are leading to ocean acidification as the seawater absorbs the gases. The accompanying reduction in carbonate ion (CO32-) concentration interferes with calcification rates (dependent upon seawater calcium carbonate concentrations) in coral – preventing them from growing reef ecosystems (Australian Center for Reef Studies). Global climate change seems to be an increasing threat to coral reefs and the ecosystem services they provide. 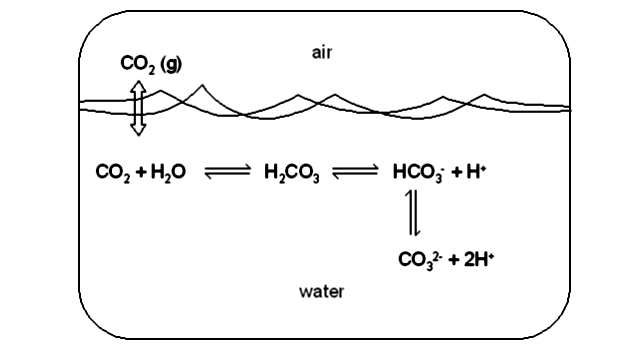 A section of the carbon cycle showing the process of ocean acidification where excess carbon dioxide in the air is absorbed into the ocean. From “Coral Reefs” powerpoint and lecture by Dr. Chris Paradise, presented on October 19, 2017. There are many marine research programs that have been studying how to slow down or prevent coral bleaching and even regrow coral at a faster rate. The National Oceanic and Atmospheric Administration is an excellent US administration that has various research projects devoted to the ecological conservation of coral reefs. One group of scientists developed a guideline to prioritize where and how to invest in coral conservation. They evaluated reefs based on whether they had a good chance of being successfully rehabilitated and then identified conservation strategies that were most likely to work for those reefs based on their specific conditions and threats (Harris et al. 2017). 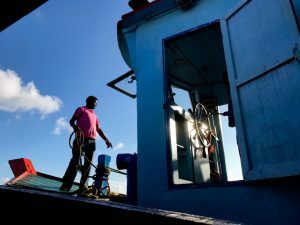 This guideline could help conservation organizations persuade investors that their money will be put to good use if the organization picks a reef that has a high chance of success. Increasing the success of coral transplants through innovative engineering is another way scientists are improving the quality and effectiveness of conservation methods. By developing an efficient structure or attachment method for coral, scientists can increase the numbers and survival rates of transplanted corals (“Coral Restoration Research L Coral Restoration Foundation” n.d.). Another group of researchers are transplanting and selectively breeding corals to increase their resistance to higher temperatures (Cave and Gillis 2017). Evolutionary experiments like those take time though, and the coral reefs we see now might not be able to survive until the end of the century if climate change and human impact continue to grow. Hopefully, tourists and students see the damage that wildlife is facing and have some concern for what the future holds. Our studies in the Andamans were balanced by frequent trips into coastal ecosystems. Photo by Sophia Pessagno. Cave, Damien, and Justin Gillis. 2017. “Building a Better Coral Reef.” The New York Times, September 20, 2017, sec. Climate. https://www.nytimes.com/2017/09/20/climate/coral-great-barrier-reef.html. “Coral Restoration Research L Coral Restoration Foundation.” n.d. Coral Restoration Foundation (blog). Accessed October 24, 2017. https://coralrestoration.org/research/. Descombes, Patrice, Mary S. Wisz, Fabien Leprieur, Valerianio Parravicini, Christian Heine, Steffen M. Olsen, Didier Swingedouw, Michel Kulbicki, David Mouillot, and Loïc Pellissier. 2015. “Forecasted Coral Reef Decline in Marine Biodiversity Hotspots under Climate Change.” Global Change Biology 21 (7):2479–87. https://doi.org/10.1111/gcb.12868. Downs, C. A., Esti Kramarsky-Winter, Roee Segal, John Fauth, Sean Knutson, Omri Bronstein, Frederic R. Ciner, et al. 2016. “Toxicopathological Effects of the Sunscreen UV Filter, Oxybenzone (Benzophenone-3), on Coral Planulae and Cultured Primary Cells and Its Environmental Contamination in Hawaii and the U.S. Virgin Islands.” Archives of Environmental Contamination and Toxicology 70 (2):265–88. https://doi.org/10.1007/s00244-015-0227-7. Harris, Jill L., Orion S. McCarthy, Gabby N. Ahmadia, E. Estradivari, and Helen E. Fox. 2017. “Planning for the Future: Incorporating Global and Local Data to Prioritize Coral Reef Conservation.” Aquatic Conservation 27 (September):65–77. https://doi.org/10.1002/aqc.2810. Krieger, Joseph, and Nanette Chadwick. 2013. “Recreational Diving Impacts and the Use of Pre-Dive Briefings as a Management Strategy on Florida Coral Reefs.” Journal of Coastal Conservation (Springer Science & Business Media B.V.) 17 (1):179–89. https://doi.org/10.1007/s11852-012-0229-9. Sammarco, Paul W., and Kevin B. Strychar. 2009. “Effects of Climate Change/Global Warming on Coral Reefs: Adaptation/Exaptation in Corals, Evolution in Zooxanthellae, and Biogeographic Shifts.” Environmental Bioindicators 4 (1):9–45. https://doi.org/10.1080/15555270902905377. Thulasimala, D., and Pearl Devdass. 2010. “Island Eco-Tourism: A Case Study of Andaman Islands, India.” Indian Journal of Science and Technology 3 (12):1247–52. https://doi.org/10.17485/ijst/2010/v3i12/29870. US Department of Commerce, National Oceanic and Atmospheric Administration. n.d. “NOAA CoRIS – A Reef Manager’s Guide To Coral Bleaching.” Accessed October 28, 2017. https://www.coris.noaa.gov/activities/reef_managers_guide/. Walters, R.d.m., and M.j. Samways. 2001. “Sustainable Dive Ecotourism on a South African Coral Reef.” Biodiversity & Conservation 10 (12):2167.